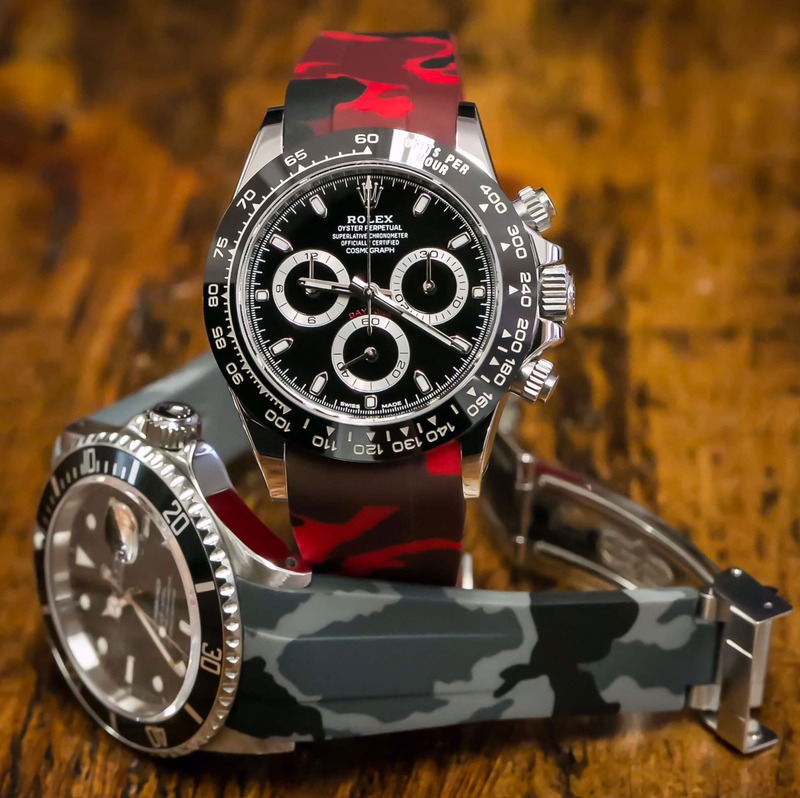 Adhering to a quality brand standard, RUBBER B watch straps are crafted and hand finished in Switzerland from an elevated density composite known as "vulcanized rubber”, providing superior resistance to damage and exterior environmental elements such as Ozone, UV, and the harsh aggressions of an aquatic environment. The result of using this material, is supreme flexibility and durability against damage or tearing, encouraging a long life without deformation or stretching from prolonged active wear. Contrary to other straps on the market, a Rubber B watch strap develops a natural patina over time, esthetically improving, while other straps fade or show wear. Permanent solid inserts contained within the strap itself ensure a safe, dependable mount, along with the ease of springbar insertion and removal, as the pin shaft is micro-calibrated to the perfect diameter. RUBBER B straps are of an exceptional caliber with regards to their material, mechanical, physical, and chemical aspects, from rubber which is of the absolute highest standard, maintaining FDA and BGVV material specifications. We do not use any blending OR COATING techniques, since pure vulcanized rubber does not need anti-dust, or friction treatments. Our rubber is smooth, dense, and elastified to a perfect level, allowing the strap to conform comfortably and naturally around the wearer's wrist. These attributes, combined with absolute passion and Swiss execution make. Stop by our showroom to see our collection of Rubber B watch straps. Horus is a maker of fine watch straps based in Miami, Florida. Each Horus exotic leather strap is hand cut & hand stitched by an artisan highly skilled in the craft of leatherwork. We stand alone in our ability to cater to each customers needs, allowing each customer to choose amongst a wide variety of leathers, leather colors, stitching colors, and more. Over time, Horus has grown to become one of the world's leading manufacturers of fine watch straps. The Horus brand is sold in retail locations in the United States, Europe, the Middle East, and Asia. "Meticulously handcrafted watch straps serving Audemars Piguet, Hublot, Panerai, Rolex, Chopard and more"
Stop by our showroom to see our collection of Horus watch straps.